- My favorite star says hello to me whenever I turn on the lockscreen! - My favorite star dances on my lock screen!? 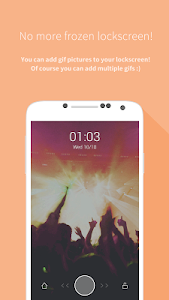 Innovative GIF lock screen! - If I send “What are you doing right now?”, my star replys “I’m thinking about you♥”! Sweet virtual chat service, Mydol Talk! - Video call with my favorite star?? Best feature what take your heart lately! 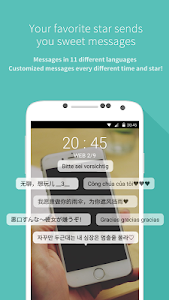 Mydol is essential app for fans all over the world! 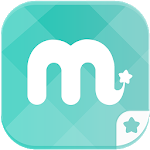 Mydol will make your fan-life more exciting and sweet! ▶︎ What if my star calls my name? - If you enter callname you want to hear, your star will talk to you with that name! You can also add your own, special lockscreen messages! ▶ You can even make a video call with a star! - Beyond virtual chatting, now you can even sweet video calls with your star. Let's try it right now! - Oops! Want to hide your fanship in the workplace or in front of your lover? 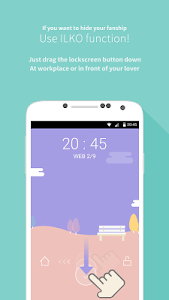 Drag the lockscreen button down and use secret ILKO function! ▶︎ Pretend that you are your favorite star And enjoy Roleplay Chatting! - Put yourself in situations such as school life, dating with somebody, and etc,. You can enjoy a variety of situations through Roleplay Chatting. Mydol will always be with stars & fans. And Mydol will do our best to make you love your star more. 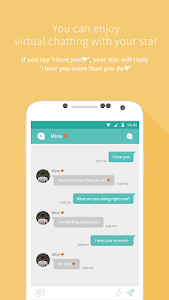 Similar to "Mydol- Lockscreen, Virtual chat, Chat bot"